The University of Houston (UH) is a state research university and the flagship institution of the University of Houston System. Founded in 1927, UH is the third-largest university in Texas with nearly 43,000 students. 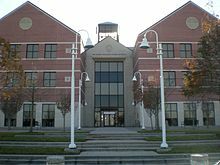 Its campus spans 667 acres in southeast Houston, and was known as University of Houston-University Park from 1983 to 1991. The Carnegie Foundation classifies UH as a comprehensive doctoral degree-granting institution with very high research activity. The U.S. News & World Report ranks the university No. 187 in its National University Rankings, and No. 105 among top public universities. UH is one of four public universities in Texas with a Phi Beta Kappa chapter. The university offers more than 280 degree programs through its 12 academic colleges on campus-including programs leading to professional degrees in law, optometry, and pharmacy. The institution conducts nearly $130 million annually in research, and operates more than 40 research centers and institutes on campus. Interdisciplinary research includes superconductivity, space commercialization and exploration, biomedical sciences and engineering, energy and natural resources, and artificial intelligence. Awarding more than 9,000 degrees annually, UH's alumni base exceeds 260,000. The economic impact of the university contributes over $3 billion annually to the Texas economy, while generating about 24,000 jobs. The University of Houston hosts a variety of theatrical performances, concerts, lectures, and events. It has more than 400 student organizations and 17 intercollegiate sports teams. Annual UH events and traditions include The Cat's Back, Homecoming, and Frontier Fiesta. The university's varsity athletic teams, known as the Houston Cougars, are members of the American Athletic Conference and compete in the NCAA Division I in all sports. The football team regularly makes bowl game appearances, and the men's basketball team has made 19 appearances in the NCAA Division I Tournament-including five Final Four appearances. The men's golf team has won 16 national championships-the second-most of any NCAA golf program. What are the academic rankings for University of Houston? 1. number 89 for Academics. What universities are similar to University of Houston?